The American Health Council is proud to select Mr. Jorge Hirigoyen, current DNP, ARNP at Baptist Health South Florida, to their Nursing Board. With 13 years in the healthcare industry, including 8 years as a nurse practitioner, Mr. Hirigoyen shares his skills and expertise in Internal Medicine, Surgery, and Sepsis Infection. 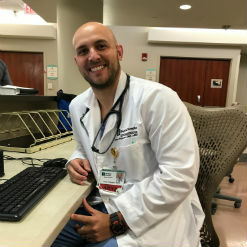 Receiving his Nursing degrees and certifications (DNP, ARNP-BC, ANCC) from Florida International University and Nova Southeastern University (2009, 2015), Mr. Hirigoyen became engaged in his current career due to an influence from family members who are also in the field of Medicine. He attributes his past and current success to a strong work ethic and endless perseverance. At Baptist Health, Mr. Hirigoyen participates in day to day responsibilities, acting as Nurse Practitioner in the Neurology/Neurosurgery department(s) and teaching within the BSN and MSN programs at a local university. Mr. Hirigoyen cites obtaining his DNP as a personal accomplishment and has been garnered with a 2011 Nurse Practitioner of the Year Award. He is professionally associated with the American Association of Nurse Practitioners. Within the next 5 years, Mr. Hirigoyen hopes to become an expert in the field of Neurology and is proud of his success thus far. He is supported by his wife, Stephanie, and their two children, Ryan and Elise. In his spare time, Hirigoyen enjoys playing tennis and spending time with family. He is charitably associated with the American Cancer Society.